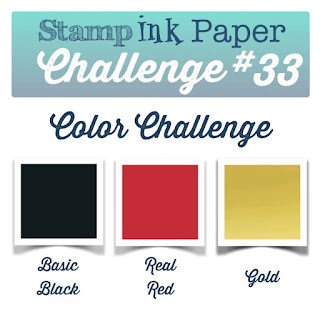 Well of course it's Tuesday which means another Stamp, Ink, Paper Challenge! This week we have an awesome color challenge for you! I wanted to use a set that I love but haven't had a chance to get much use out of... Market Fresh. I love the Strawberry "Just Ripe for You" Image but it hadn't even been inked up yet. Isn't it sad to have all of these great stamp sets and not enough time to use them all! I started off with a Very Vanilla A2 card base, layered with a 4" x 5 1/4" piece of the Farmer's Market DSP in a Very Vanilla and Black stripe. Next was a 4" x 3 1/4" piece of real red with a piece of Black Stitched Satin Ribbon around it and knotted to the left side. 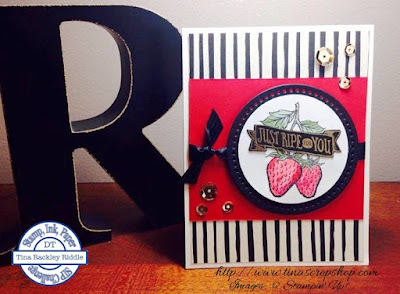 My Strawberry image was stamped with Black Archival Ink onto Watercolor Paper and watercolored with Real Red, Pear Pizazz and Mossy Meadow. I also stamped the image with Versamark onto Black Cardstock and heat embossed it with Gold Embossing Powder. I then fussy cut the banner off of the embossed image and adhered it with Tombow Multipurpose glue onto the watercolored image. I punched it out with a 2 1/2" circle punch and layered it behind a Basic Black Circle cut out with Little B's Pierced Circle Dies. I adhered the circle layers with Stampin' Dimensionals and added some Pretty Pink Posh gold sequins. I really love it and love that it's so different from most of my cards.